14. "People Won’t Believe It." 30. "Nobody Paid Any Attention"
When it was published in 1939, The Nature of the Chemical Bond and the Structure of Molecules and Crystals: An Introduction to Modern Structural Chemistry became an instant classic. It was targeted to graduate-level chemistry students for use as a text in upper-division courses, but its impact went far beyond the classroom. 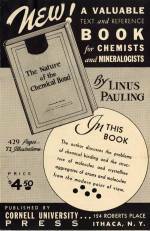 The book would change the way scientists around the world thought about chemistry. For the first time, the science was presented as the natural result of quantum mechanics operating at the level of the chemical bond. Observable chemical properties such as melting point, boiling point and bond strength resulted from molecular structure; molecular structure resulted from the bonds that held the atoms in position; and the bonds resulted from the quantum nature of the atom (as understood by physicists). The book also introduced chemists to the importance of X-ray crystallography as an important tools for determining structure. Before the book’s publication, few chemists had taken notice of the arcane art of crystallography; after its publication no chemist could ignore its value. See Also: Letter from Linus Pauling to W.S. Schaefer. June 13, 1939. See Also: Review of The Nature of the Chemical Bond by George Kistiakowsky. February 1940. Advertisement for The Nature of the Chemical Bond. 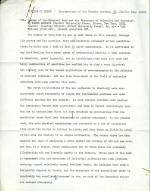 1939.
Review of The Nature of the Chemical Bond by Leslie Sutton. May 1940. "I have been very much interested by your new book and have assigned several of the chapters for reading in connection with a graduate course. As evidence of my interest in it I can cite the fact that it is the first scientific book which I can remember reading during the course of a fishing trip, although I have carried many with me in the past."